There are a number of holidays just around the corner (you can’t deny it any longer – summer is over!) and that means it’s nearly time to get your apartment dressed up for the season. Springs Apartments has your decorating needs covered, with simple ideas to help make your end-of-year holidays a little more festive. All our ideas are budget-friendly, simple to do (they require little or no creative or crafting ability), and take very little time to put together. Pick up a pumpkin at your local grocery store, cut out a top (just as you do when making a jack-o-lantern), and clean out the inside. Now use the pumpkin like a vase, filling partially with water (make sure to move the pumpkin to its final destination before adding water, and place on a plate to avoid water marks on your furniture), and adding a bunch of cut fall flowers or a potted mum. You can also buy mini pumpkins (about the size of a grapefruit) and similarly cut and core each and drop in a votive candle. Sprinkle the inside of the pumpkin with cinnamon before adding the candle and your apartment will smell like pie! 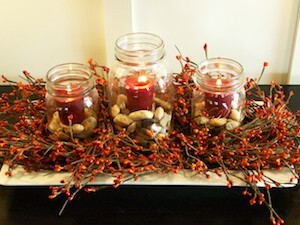 Mason jars – old-fashioned glass canning jars – are great for showcasing fall- or winter-themed elements. 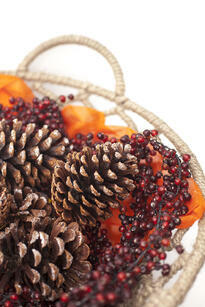 In fall, fill them with acorns, small artificial pumpkins and candy corn; wrap an orange ribbon around the neck. You could also drop a battery-operated candle and colorful leaves in the jar for a warm glow. In winter, fill a large Mason jar to the top with red, green, and silver ornaments and top with a pre-made bow, or fill multiple jars with different colorful holiday candy assortments and use them together as a centerpiece; place a scented votive candle on the top of each. A spray is essentially a bunch of greenery or branches tied together at the top or center, mounted on a door or above a doorframe. Go to your local park or natural trail and find fallen branches that still have leaves, or go to a garden center or hobby store and buy real or artificial pine branches; take 4 or 5 and point them in one direction, then take an equal number and point them in the opposite direction, overlapping stem ends with the other bunch. Take wire or twist ties and, in at least two spots, bind the two bunches together. Now, find something to put in the center to cover the stems. For fall it might be artificial mini pumpkins; for winter it might be a felt snowman or a small empty box wrapped in shiny gift wrap. Hot glue the item onto the branches. Create a wire “hook” and attach to the back of the spray so you can hang this on your door, either on the outside to greet visitors or inside to add cheer inside! Light sets are available at home centers and hobby stores in a variety of colors and color combinations – even black and orange for Halloween; they come in plug-in and battery-operated styles. Drape a set over your windows (attach using a removable product, like Command® strips), over doorframes or even just as a “pile” in the center of a table, dotted with colored ornaments. You can also dress up your light strings with non-flammable ribbons and lightweight ornaments. One of the simplest ways to dress up your apartment without having to do any work is to put out holiday-themed accessories, like a welcome mat, throw pillows, guest towels, and placemats and napkins. You can also purchase inexpensive reusable plastic holiday dinnerware and paper cups for entertaining. Decorating your apartment for any holidays makes it feel more like home and lifts your spirits and those of your guests. Pick a few of these ideas to get your apartment in the spirit of the season, then take a picture – we’d love to see your home all decked out for the holidays!